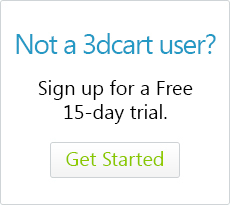 3dcart allows you to export your order history in CSV format. This ability can be useful when you need to import your order history into specific accounting software, or if you need to review your order history for a particular date. Click on the + symbol next to "Orders"
Select your export filtering parameters as needed. You will have the option of filtering the order export by Distributors, Date Ranges, and Statuses. You can also use the "Include Order Items" checkbox to list ordered items along with their respective orders. Lastly, you can also create a custom export set that includes only the parameters that you need. After selecting your export parameters, click on the "Export Data" link to generate the CSV file which can then be saved to your computer and used as needed.